Hippeastrum (Hippeastrum spp. ): growing, planting, caring. Large fleshy bulbs and tall broad leaves, generally evergreen, and large red or purple flowers. Scientific name : Hippeastrum spp. Hippeastrum is a genus in the family Amaryllidaceae native to South America, with about 90 species and over 600 hybrids and cultivars. Hippeastrum bulbs are generally between 5–12 cm (2"–5") in diameter and produce two to seven long-lasting evergreen leaves 30–90 cm (12"–36") long, and flowers arranged in umbelliform inflorescences on an erect stem 20–75 cm (12"–30") tall. Each flower is 13–20 cm (5"–8") across, and the native species are usually purple or red. They are funnelform - funnel shaped -and declinate - curving downwards and then upwards at the tip - in shape. Cultivars and species can be grown inside in pots or outside in warmer climates. Amaryllis are bulbous plants that bloom every year. They carry fleshy leaves, in ribbons, and large funnel-shaped flowers. Plant your amaryllis in the ground only if temperatures never drop below -5 ° C at your place. In open-soil, in late summer or in spring, plant your bulbs without burying the top, in a draining and rich soil. Warning: Amaryllis do not withstand stagnant water during the winter, it makes them rot. In pots, you can use a mix of potting soil and sand to plant your amaryllis. Choose a container a little larger than the bulb, about 3 to 5 liters. When planting, do not bury the top of the bulb from where the leaves emerge. Tamp the soil well then water. Place your pot in the light, without sticking it to a window. That's all ! No need to water much the amaryllis, you risk making them rot. Bring water once or twice a week during growth, and during dormancy stop watering to let the bulb dry. If your amaryllis is in a pot and you want it to bloom each year, you need to protect it from the direct sun at the end of the season, and let it dry. So, as soon as the flowers are withered, stop watering and let your amaryllis rest until the following autumn. - if it is planted in open soil protect the evergreen leaves under a thick mulch. 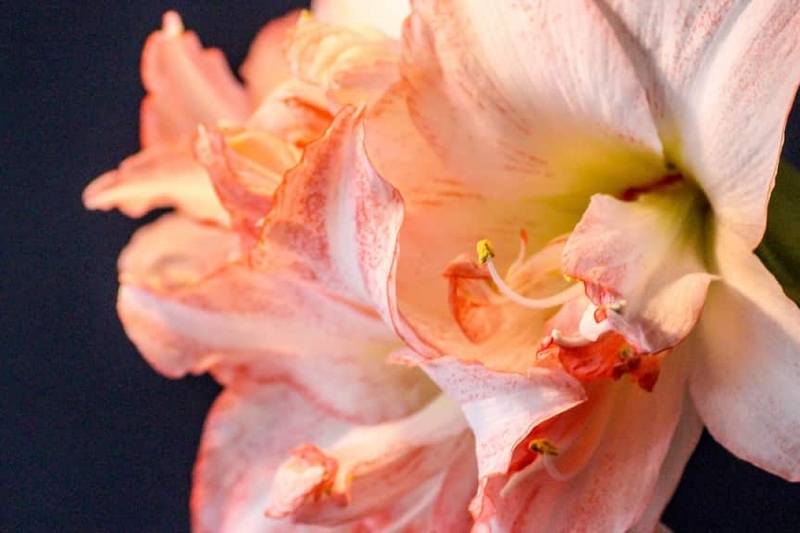 - Inside: Amaryllis are subject to whiteflies and red spiders. For the latter, a spraying of demineralized water from time to time slows them down. Regarding whiteflies - very small white flies - if you can spot them and your plant seems to be suffering from them, spray black soap on the leaves and wipe them off. - Outside, slugs are fond of amaryllis, but an offering in another corner of the garden can attract them elsewhere - beer, cruciferous plants or other.